Don't just roll the dice! The time to get a Professional EMF Radiation Survey is before you close on a house with power lines or cellular towers nearby. 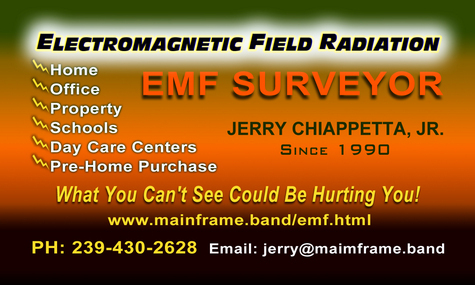 Jerry Chiappetta, Jr. has been conducting professional and very affordable EMF Surveys in Florida since 1990. For more information on EMF Radiation and to inquire for an EMF Survey Quotation visit the photo business card site or call Jerry Chiappetta, Jr. (EMF Surveyor) at 239-430-2628 today.